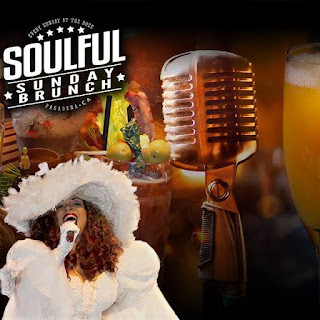 PASADENA, CA — Spend your Sunday mornings at The Rose in Pasadena for Soulful Sunday Brunch, complete with live Motown music performed by a plethora of seasoned and soulful musicians, plus an inspirational gospel choir, and a menu that is sure to please and then some. Pasadena’s newest and hottest concert venue, The Rose has already proven it’s worth bringing legendary acts like The Temptations, Smokey Robinson, Kris Kristopherson and Styx to this diverse and cultured city. It’s upscale dining and signature craft cocktail menu adds class to an intimate and unique concert experience. Now raising the bar even higher, The Rose has introduced its Soulful Sunday Brunch, held every Sunday at The Rose. 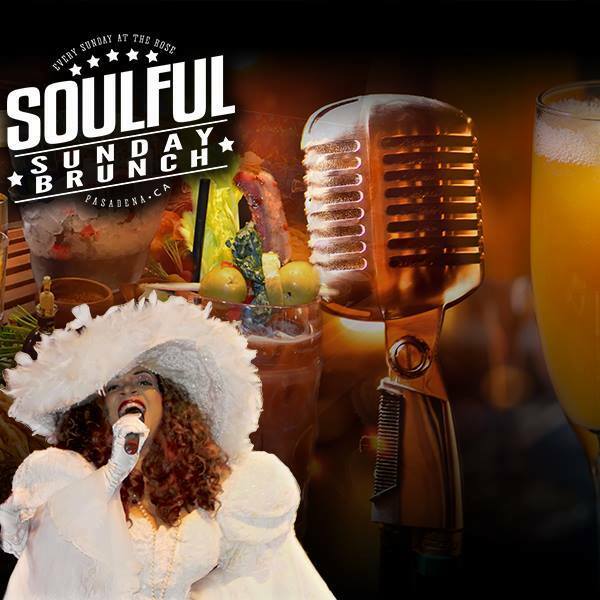 Hosted by Miss Sylvia St. James, formerly of the world famous House of Blues Gospel Brunch, the show is an array of soul and Motown hits, as well as a little Gospel flare for your Sunday morning. Brunch is a southern inspired feast, featuring dishes like Fried Chicken and fresh made Belgian waffles, BBQ Pulled Pork, BBQ Chicken, a Slow Roasted Prime Rib carving station, Creamy Mac and Cheese, Creamed Corn, Yams, an array of breads and pastries, including homemade corn bread and honey butter, and an Omlette station that will have you coming back for seconds. Of course, Brunch wouldn’t be complete without a delicious mimosa, or Bloody Mary, and The Rose has you covered, offering a full bar in both the lobby lounge, and the theatre. Sundays will never be the same once you’ve experienced The Rose’s Soulful Sunday Brunch. 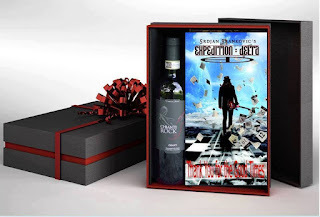 It will leave you undeniably satisfied and entertained. Brunch is served at 10am, and the show starts at 11am. Make sure to arrive early to enjoy as much of the experience as possible. You don’t want to miss one minute, or one bite. Artist, Songwriter and Producer Glitter Rose has almost completed her new album Outlaw In Love and has launched an Indiegogo Campaign to raise the finishing funds. 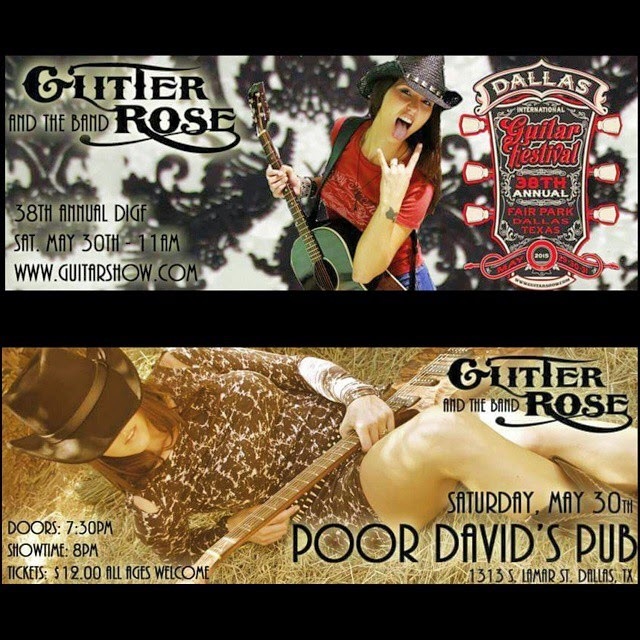 LOS ANGELES - Jan. 1, 2016 -- Texas raised Glitter Rose is an independent southern rock artist based in Los Angeles, CA. 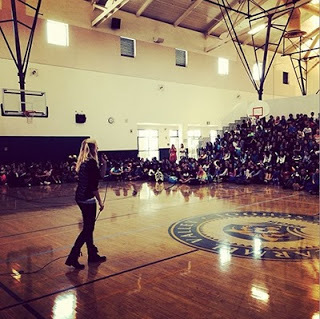 In the 5 years she has been in LA, she has held residency at Hard Rock Cafe Hollywood Blvd, headlined House of Blues Sunset Strip, won 8 awards, including AIMA Album of the Year in 2013 for her 2012 release Dead or Alive, AIMA Artist and Performer of the Year in 2014, LAMA Country Artist of the Year in 2013, and her music video Buda Negra was awarded Best Music Video in the BBIFF 2013 and AIMA 2014. She has also written songs and recorded music for films such as the independent romantic drama American Girl and the Korean box office smash The Technicians. She also was Music Director and Composer for How To: The Musical, which was a short film for the 48 Hour Film Project Los Angeles 2015. Glitter is nothing short of an extraordinary artist, but in addition is an advocate for several charities including St. Jude Children's Research Hospital, Defenders of Wildlife, Futures Without Violence, and The Ally Coalition. She is also a Producer at KGUP FM Emerge Radio, an internet radio station out of Los Angeles, CA and pursuing a career in Music Therapy. 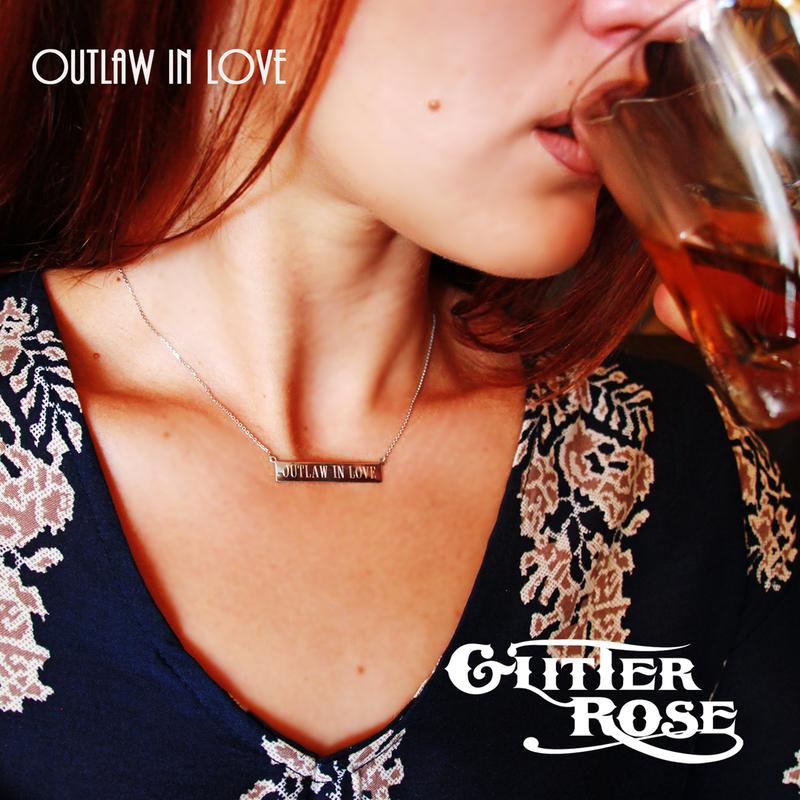 Glitter has been recording her new album Outlaw In Love since March 2015. The first single, titled Hollywood Rain was released in September 2015, and was submitted for consideration for the 58th Annual Grammy Awards. The music video, released September 30, 2015 has reached over 2,000 views and counting. The original Indiegogo campaign for Outlaw In Love to start recording made just over $5,000, a third of the goal that was set. Since the project did not reach its goal, the recording process took longer, and has now come to a hault because more funds are needed to finish the project. Through January 30, 2016, Glitter's new Indiegogo campaign will run with a goal of $2,500 to finishing recording, distribute, and print the new album. 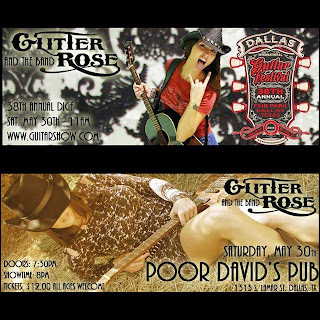 Please visit www.igg.me/at/glitterrose to learn more about the new album, the recording process, and what perks are being offered to raise the money needed to finish the album. Perks range from $5-$750 with offerings including Private Whiskey Tasting with Glitter and friends, VINYL exclusive to contributors courtesy One Groove Vinyl, Letters by Zoe fine jewelry, and even access to the private, invite only CD Release Show and Live Filming at the Gibson Brands Showroom in Beverly Hills, CA. For more information about Glitter Rose, please visit www.thisisGR.com and link to her social media sites via the buttons on her website. Sheets, The Color Wild, and Lyndsey Elm (The Voice) to benefit victims of Lake County fires including areas in Cobb Mountain, Anderson Springs, and Hidden Valley Lake on October 11. 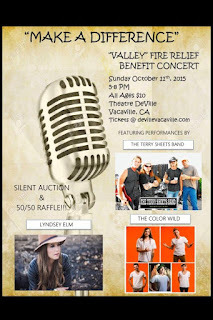 Vacaville, California, October 1, 2015 - DeVille is joining up with some local hometown heroes to try and do their part in providing relief for friends and towns effected by the tragedy of the California fires. 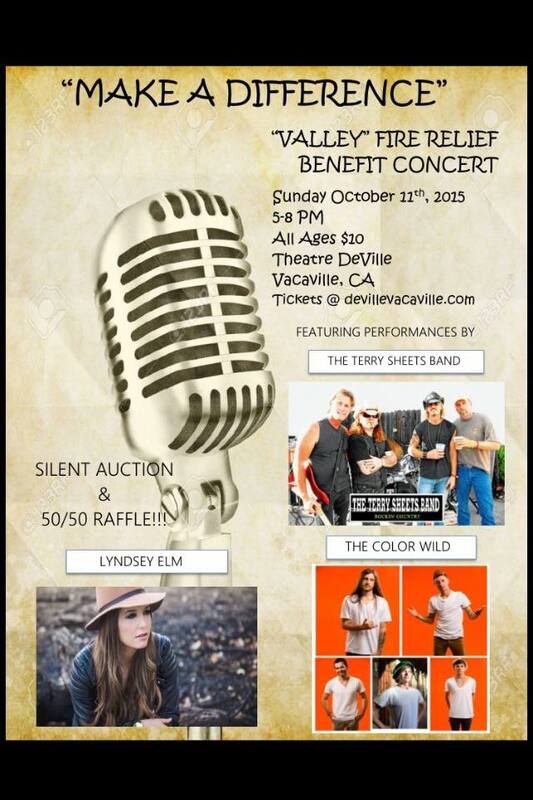 Deville Vacaville concert venue is pleased to announce they have joined forces with The Color Wild, Terry Sheets Band, and this years The Voice contestant Lyndsey Elm for a benefit concert filled with epic performances. The show will be from 5pm-8pm on October 11th. 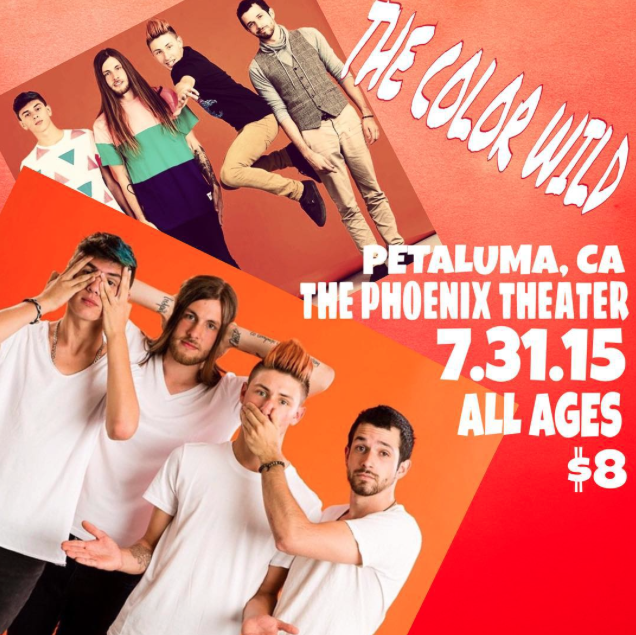 It is an all ages event so bring the whole family. Tickets and all the final information will be announced later this week so stay tuned and help spread the love with us. The "Valley Fire" lasted five days from September 14-21, ravaging over 73,700 acres and stretched across portions of Lake, Sonoma and Napa counties. Well over 3,900 firefighters battled the blaze during this five day stretch. Thousands of residents were displaced and are now homeless and claimed the lives of three people. Over 90 percent of Anderson Springs was destroyed, leaving fewer than 10 structures that remain standing. With the town of Anderson Springs virtually wiped out by The Valley Fire, it is time to rebuild and may take several years before the town is back to its former self. Trees need to be replanted in their place and structures need to be rebuilt to make it home once again. "We decided to put on a benefit concert not only to help financially for those that have suffered such great loss but also to offer some emotional support as they try to put their lives together one day at a time," says event organizer, Bill Crosson. "There's no blueprint for how to survive such a tragedy and move forward and there is certainly no timetable before things become as close to normal as possible. This concert is just a small step combined with so many other generous helpings hands our community has﻿ provided recently." The Valley fire changed the way many families will live their lives moving forward. There were so many heroic efforts and stories yet to be told, but unfortunately along with that comes many scars and trauma that many experienced and will continue to experience! Thank you to our corporate sponsor On-Q Financial as well as our local sponsors KMA Limousines and TAMARA HANSEN of Coldwell Banker Kappel Gateway. August 05, 2015 – Borehamwood, Hertfordshire - Dresses And Every Other Fashion Product Of All Budget Ranges Are Now Available Online through Be Gorgeous Styles at www.begorgeousstylesandbeauty.com. Here is an exciting news for those who want to buy fashion products and other items online! Be gorgeous styles by Mimmmie, an online store, is selling these items and not only that, the company offers all the updated products. They also offer dresses and products of various sizes that may be needed by men, women and children. Another good news is that the company is offering 20% discount on every product to all their new customers. For those who buy at lease for £70.00, the company makes free delivery of all the items. Those who recommend a new customer will get an additional 20% discount on their next order. Be Gorgeous Styles assertively says that clients can be certain of finding the most unique, updated and trendy footwear, accessories, clothing, hair products, jewellery, and health and beauty products, electronics and sports items and various other products needed for a home with them. In short, the company is confident of effortlessly catering to every need of their customers. Since the budgets, occasions and personal preferences of customers may vary widely, they keep all the items that may perfectly fulfill all these yardsticks. The company further adds that among the products they retail, customers will find every item that would suit their fancy in every category including health and beauty, jewellery and accessories, footwear that include Boots, Shoes, High Heels, Wedges, Flats, Slippers and collection of men’s, ladies’ and children’s clothing that include Long Sleeve, Maxi Dresses, Menswear, Blouse &Shirt, Vest, Leggings/Trousers, Jacket & Coat, sport, Skirt, Sweater and so on. Mirriam who owns the company has a vast experience and she has even been working as a CEO of ZBIL -Zambian Bridge for Inclusive Living- a charity Organization that supports communities in Zambia and that is planning to extend its programmes to other chiefdoms such as Chief Mumena and Chief Matebo, while targeting one community in the other three districts. Mirriam has also worked as a model and she also undertakes deals of some of the modeling industries for dressing their models with her stylish designs. This means she keeps abreast of the latest fashion trends and this helps her immensely in offering the latest and updated products through Be Gorgeous Style. With her experience, she knows that the needs, tastes as well as financial resources of people are asymmetric and that is the reason she ensures to offer different types of products at various price ranges. Be Gorgeous Styles by Mimmmie is an online store that sells fashion products and various other items that include clothing, footwear, accessories, jewelry, electronics and every other item that may be needed for a home. The company makes it a point to offer all the updated products. They also offer dresses and products of various sizes that may be needed by men, women and children. 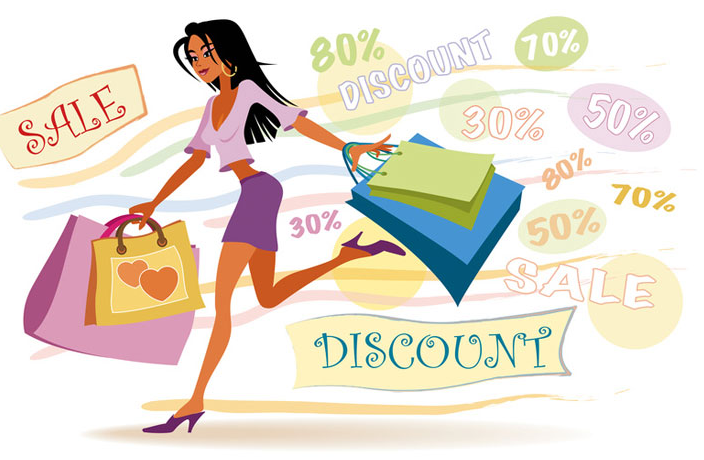 The company is offering 20% discount on every product to all their new customers. For those who buy at lease for £70.00, the company makes free delivery of all the items. Those who recommend a new customer will get an additional 20% discount on their next order. customers a discount off their first order with free shipping. Be Gorgeous the online clothing fashion store has today announced they are offering new customers an introductory offer of 20% off their first order. They have also announced they are offering free delivery on all items. The online fashion store that sells the latest in women’s and men’s fashion at affordable prices is offering customers 20% discount off their next order when they recommend a friend. They have decided to provide their loyal customers with the discount as a way of thanking them for making Be Gorgeous one of the recommended online fashion sites. Fashion has always been important to women, but in recent years it has become just as important to men who want to look their best no matter what time of day it is. Finding the latest fashion at affordable prices for men and women can be a struggle, it can also be time-consuming visiting different high street stores. Be Gorgeous has made the whole process of finding the latest fashion items at affordable prices simplified. The online fashion store that sells footwear, clothing, dresses, boots, maxi dresses and a whole range of fashion items has gained its reputation by offering quality items at low prices. It has become a one-stop shop for people wanting to wear all the latest fashion without paying the high prices from high street fashion outlets. By comparing prices around the Internet they give their customers the best deals available, and now with free shipping and 20% discount for referring a friend, their prices have become even lower. Be Gorgeous is an online clothing store that sells the latest fashion trends. The company has updated fashion products for men, women and children of all sizes. At Be Gorgeous Styles by Mimmie, consumers are guaranteed of getting unique, most updated and trendy footwear, accessories, clothing, hair products, jewelry, and health and beauty products. "Man Outta You" by Saniyé Now Playing Around the Country! For Immediate Release: "Man Outta You" by the award winning Saniyé! Multi-Award-winning New York City-based Pop-Jazz musician Saniyé returns with her much anticipated new single "Man Outta You" off her brand new EP due out Summer 2015. “Man Outta You” has been played on KISS FM and Saniyé has had incredible write ups and appeared on several television shows including Metro Unplugged TV, Bloomberg TV, Fox TV, The Rhythms of New York, Broadjam, Bodrum Magazine, TimeOUT NY, The Village Voice, Global Rhythm Magazine, MTV, CNN, and more. The official music video for "Man Outta You" is due out June 2015. 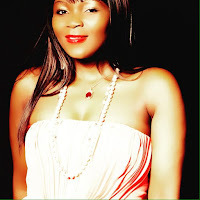 Saniyé started writing songs and playing music at the age of 5, so it is no surprise that her emotionally driven and debut eclectic album “When I Don’t Sleep” made it’s rounds nationally and internationally with much success. 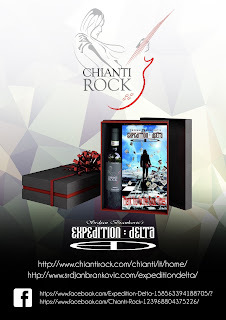 Songs from the album aired on Delta Airlines and many are still currently playing in stores nationwide in the U.S. Her music featured on MTV Europe, tastemaker stations across the nation and most notably, "Boom Sheke Nana" won the Grand Prize in the John Lennon Songwriting Contest. Saniyé, went on a thirty-city tour, headlined a show at Joe's Pub in New York City and ended the tour by opening for multi-platinum selling singer songwriter, Lisa Loeb. Saniyé describes the first album, "It was like a diary. I was shy and exposed at the same time. Looking back I can see I was shedding my sadness and working through the loss of my father. To say the least my fun and bold spirit was a bit squashed after his death. Purging these emotions has helped me get back to my fun, flirty, mischievous essence." Saniyé says she has definitely matured musically since then but hasn’t grown up in the traditional sense, “I never want to fully own the title ‘grown-up’. I think the magic of life is in play, mischief and for me, music. I don’t think when we become a certain age we should have to abandon this side of ourselves. My music attempts to bring that out for all of us." “The second album feels like a rebirth. I am really expressing myself from the person that I was when I was little. It’s just pure fun and it feels great to reclaim the part of myself that is very much like my father. My mom tells me stories all the time about how I remind her so much of him with my playful nature. He was that 47-year-old guy who would press all the buttons in the elevator just for kicks. In this way my music is homage to him, the father who I never really got to know. This keeps him alive for me. Life should be fun and I hope to create a space in my music for the world to feel that. “My influences are other bold and playful artists that say what they want with no apology. Lily Allen, Pink, Eliza Doolittle, Regina Spektor. Most of these artists are very feminine but unapologetic about who they are. This can also be so healing for women in general. We are lucky to have the freedom to be fully expressed. It is important to accept everyone for who they are. I hope my music can help bring people together in this way. I encourage everyone to accept all parts of themselves. For me I love video games AND I love playing dress up and experimenting with fashion. This is me, I refused to believe that I had to be one or the other. I’m that girl you will see in heels at the arcade playing a racing game, beating the boys."